On Vince's Gym: Like many famous old-time establishments it offers a quality product. Kept simple by design, it shows more pride than pretense. Its owner, Vince Gironda, says, "The more you know about training, the less complicated the equipment you need." Vince and his gym have become an institution. When the actors of Hollywood realized that physical good looks part of their stock-in-trade, they beat a path to his door. Many physique stars have done the same thing. You could find Clint Eastwood training alongside Larry Scott. If bodybuilding is considered to be a cult, it could be said that teaching it has turned into a cult of personality. [A cult of personality arises when an individual uses mass media, propaganda or other methods to create an idealized, heroic, and at times worshipful image, often through unquestioning flattery and praise.] If Vince had his place on a Tibet mountaintop instead of near the major motion picture studios of Hollywood, his followers would make the pilgrimage! There are reasons. He has the mentor's magnetism that comes with many years of experience. His interest has always been at muscle level undiluted by dreams of wealth, which you could suspect he might have. He dispenses vitriol and wit, along with solid lessons, which appeals to his sophisticated audience. "You don't have to pay attention to diet anymore. You can get big and cut up on steroids and synthetic thyroid. As an alternative you can overtrain, of course, which causes muscle tissue loss and puts you in negative nitrogen balance. Like a long distance runner, you get stringy . . . overtonus . . . loss of tissue . . . going over the fine dividing line. "You don't have to be very scientific about training today. It's still all the size thing, you know. Who really trains for shape? Who even knows how to shape a muscle? They'll take anything they can get, as long as it's big. "I've never turned out guys that were really huge. Larry Scott was a pretty good size. Mostly, however, the fellows from this gym are shapely. The idea of training down, losing about 25 pounds, and ending up with definition and shape started with myself and a few other men some years ago. I once lost a Most Muscular title to Bob Shealy because I was too defining, according to the judges. I wanted that title badly, too. I did well in contests back in those days, especially when they had applause meters or women judges. I didn't win many but got a lot of seconds and thirds. "Scientific bodybuilding seems to be slipping. I keep looking for ways to build more muscle tissue faster with less work. i have some fellows here that are maintaining maximal development on three sets per exercise, 20 to 25 reps per set. They train about 20 minutes. Of course, they had reached a rather high degree of development to start with. "I remember back when Ray Schaefer took several minutes to do a curl. He did three sets and could get in shape at will. The idea isn't new. I've been experimenting with it for years. I did only six sets of six on a muscle when I was training for the Mr. Universe contest in London. I tried 10 sets of 10 for a while, but I had to give that up. It was too much for all the body parts. You can do 10 sets of 10 on one bodypart if you are specializing. Never the entire body. "Everybody wants definition these days, but that doesn't mean doing 10 sets of 10 - it means watching what you eat. When you want to get in shape, you first lose the fat, and then you pump up the remaining muscles that's always been there. "I can't see much change in the way people train today as against what they did 10 or 20 years ago. I think steroids are the answer now. You can't win a big contest now unless you take them. "In the days before steroids the bodybuilder had to learn how to train. Steve Reeves is a classic example. He was scientific and precise. But there you must give credit to Ed Yarick who taught Reeves much of what he knew. Ed also brought out Jack Delinger, Clancy Ross, and Norman Marks. I think he was the first real scientific gym owner. "Steve knew how to isolate muscles and dodge body parts. He never did squats. He did mostly hack lifts that avoided hip and glute development. His structure shows it. He had heavy development around the knee. He used as much weight as his strict style would allow. "If you hold a 20-pound weight out at arm's length in the strictest style, it soon gets heavy. You don't need a lot of weight. Still, it's very hard to isolate a muscle. I don't think it's necessary. There are degrees of isolation. Total isolation of a muscle would produce no strength at all. Individual muscles often have more than one attachment. The deltoid has three parts, all originating on different parts of the shoulder girdle. It comes from the word "Delta" which means triangle. "Drugs have really set back the science of bodybuilding. With drugs you don't have to know much. A guy will come in to train with a 16 inch arm, and in a few months with the drugs he's got it up to 18 if he carries enough bulk on him. In the early days the measurement never varied much. Why, I've had famous bodybuilders stand in front of my desk and say they were going to go into a show in a week. I'd look at them and say Holy Cow, but, you know, a week later they would be in shape. In my day it would take me nine months of training. You know there is only one way they can make gains that fast. "Not everybody responds equally to drugs. Some it doesn't affect much at all, while others take off on them. "I continually look for easier and faster ways to build muscle because that's the business I'm in. I simplify training to a large degree. The guy at home is doing a lot of exercises on a muscle. He doesn't know what part of the muscle to work that needs the work, he doesn't know the corresponding exercise. He overworks the abdominals to where he throws the body into a state of shock so that he can't gain muscle tissue at all. Abdominal work is not a subcutaneous fat emulsifier. You get rid of fat by not eating as many calories as you burn up per day. You can also stimulate the thyroid in a natural way. It seems that both overweight people have a digestive problem. They need enzyme supplements with every meal. "You don't burn off fat by excessive repetitions. All you do is stimulate the muscle and try to find a balance, nature's balance. Nature isn't mega-vitamin doses. Too much protein can make you fat! You can put yourself in negative nitrogen balance by eating too much protein. Animal protein is the best. I advocate both meat eating and vegetarianism at different times. I think you should eat meat and take supplements when you are working out very hard. Meat and supplements together is a very stimulating diet. Vegetarianism is not as stimulating, but you get minerals, and put sodium back into your liver. However, I've found you can't get a muscle pump. You can't feel your body. You don't have drive. In another way it is good because it gives your body a rest. "You can't store protein. Protein is acid. You can put yourself in an acid condition and get things like goat. I've seen this happen to some people who never give their body a rest. They've lost a primitive animal wisdom. They can't seem to do what their body tells them. I myself can get to the point where I find meat distasteful. "If you can't respond to excess protein, you should practice vegetarianism at least one day a week, anyway, on a rest day, to get the sodium back in your liver, to allow an excess of stored nutrients to be burned up. "There are self-styled diet experts in this business that pour supplements into people at a ridiculous rate. I've overloaded on supplements myself, and wondered why I wasn't feeling better. A few days layoff restores a positive response to my training efforts. I only take supplements now as I feel I need them. I leave it to instinct. I think everybody has this instinct, but it may take years before you begin to recognize it. The average neophyte or intermediate bodybuilder takes them because he is told it is the thing to take. If you read all the pamphlets on vitamins, you will swear that everyone of them is just what you need. It's like reading medical books on pathology. You begin to think you have every disease in the book. "If you are super ambitious, highly motivated and insecure, I might add, you'll pour those supplements in every day. I have worked out with colds and other illnesses when I should have been in bed. Such zeal never did me much good. As I look back, I remember guys who made the most gains took training lightheartedly, would stop at the drop of a joke, were always in good humor and didn't push themselves excessively. George Eiferman snoozed while others trained, and he grew massive. When he trained, it seemed like a picnic in the park. "I would fast for three days to pick up definition under my navel which was never easy. I didn't stop working out and didn't feel any different. If you have determination and motivation, I don't think three days without food is going to harm you. It didn't affect my strength whatsoever. I would start eating again because I began to lose muscle tissue. "Individual metabolic rate must be considered in the matter of frequency of meat eating. I found that there was very little food I could eat to get the definition I wanted. Meat didn't always sustain me. I went to hard boiled eggs and butter in the morning. It was the only thing that seemed to raise my energy level in the morning. With meat I would be hungry again within an hour, and you can't go eating meat all day because you can get fat on it. I found that on a half a pound of hamburger a day and two eggs in the morning I was gaining muscle size. "The less you put into your body, the more you extract from what you put in. Your body becomes more efficient. I also think that food combinations are not necessary. "A man by the name of Stephanson (sic) [Vilhjálmur Stefánsson]who lived with the Eskimos for eighteen years proved that a "balanced diet" is a misnomer. He lived on meats and fat exclusively. He ate no yellow or green vegetables or roughage. The seven elements of the so-called perfectly balanced diet did not exist in the Eskimo diet. They were perfectly healthy. Fat was the most wanted item during the very cold periods. Checked out at the Bellevue Hospital for a year after his 18-year stay with the Eskimos, his cholesterol count was perfect, along with everything else. The primitive diet appears to be the best. "The body can extract more from less. Jewish food habits 6,000 years old of not mixing carbohydrates and protein in a meal, which are not compatible, had a native wisdom that got lost in time. "Americans consume too much food. In experiments, mice that are underfed from birth tend to live longer. Animals that are placed under reasonable stress also live longer than animals that are under no stress at all." In part 2 [I hope I can find a copy!] Vince Gironda continues to unfold the fascinating lore of his vast experience during three decades as a teacher of bodybuilding. 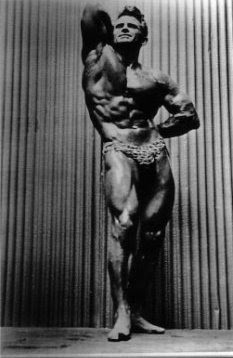 He discusses the attitudes and temperaments that made champions like Larry Scott. He tells of where bodybuilding has been and where it is going, and he offers proof that anyone can become a better bodybuilder.